Yep. We love to cook and we love to eat. And we really love to grill and smoke and slow cook and barbecue. 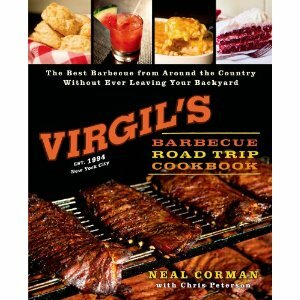 Virgil’s Barbecue Road Trip Cookbook had my mouth watering. From the folks behind Virgil’s restaurants, including the flagship on Times Square, NYC, this is a collection of their best recipes. The book is a cookbook but so much more. It opens with an overview of barbecue and grilling basics and techniques. Then the recipes. It finishes up with suggested menus. Every single recipe sounds wonderful. They are divided into sections with drinks and sides not neglected. Chicken, beef, pork and seafood all get a generous portion. And each recipe is annotated about where and how the restaurant staff arrived at the combination of flavors and which barbecue region it best represents (the Carolinas, Memphis, Texas, or Kansas City). As I read about the special spice and rub and marinades, I expected the authors would be proprietary about them and recommend you order the spice blends from Virgil’s online, but the full recipes were all included. I’m impressed. That’s a company that’s confident of two things: the tastiness of their goods and the willingness of the general eating public to continue to visit the restaurants even if (theoretically) they could replicate their favorite at home. I’m kicking myself that we didn’t visit Virgil’s when we were in New York a couple of years ago. We spent a good bit of time around Times Square. We made sure to have pizza and other NY favorites, but somehow, barbecue didn’t top the list of New York specialties. The recipes are easy to follow. The book is written in a folksy voice that makes the reader/cook feel like they’re just sittin’ around talking ‘cue and meats with someone with a bit o’ learnin’ about the subject. This is a “cookbook” that will be spattered and stained in no time. I can’t wait to try … well, all of the recipes. The Universal flour looks like it alone will make my deep-frying disasters a thing of the past. I received a free electronic edition of this book in return for a fair review. I don’t know how fair it is that I now have to go buy the book since I can’t stand cooking from my Kindle or iPad. But that’s just me. It’s a great book and I highly recommend it!